My daughter absolutely loves arts and crafts. She could craft for hours and hours and she loves creating items and giving them to friends and family members as gifts. She's definitely her mother's daughter. That's why I knew she would absolutely love the Gelarti Designer Studio Foils. The kit allows her to paint, peel and place reflective foil stickers on her wall or windows in her room. What I love about Gelarti is that this was very easy for her to use and there was little set up called for when she took it out of the box. She didn't need any help from me. It doesn't need batteries, which is a plus and it's mess free, which is another plus. The set comes with stickers that are a mix of small, medium and large. She loves that she can stick her stickers on her walls and windows and if she feels the need to move them to another area, she can and they'll still stick in another place without a problem. She's even placed a couple of the stickers on her notebook and showed her friends at school. This would be a great gift this holiday season for any girls who love arts and crafts. Affordable and easy to use, Gelarti Designer Studio Foils is the perfect gift for young girls. They'll love that they're able to decorate their own stickers and place them on their wall for show. The Gelarti Designer Studio Foils retails at $19.99 at your local toy stores. 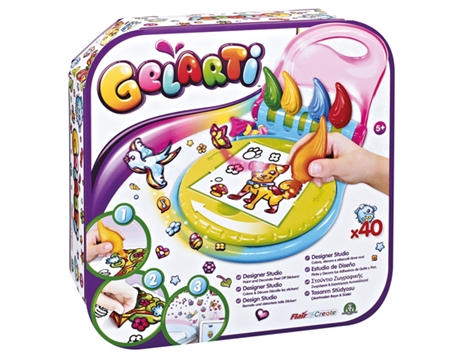 There are so many other different types of Gelarti. We also received the Lalaloopsy Sew Cute (retailed at $12.99) as well and I can't wait to give that to her for her to use. She still loves Lalaloopsy and I'm sure this will be a hit as well and is perfect for any girl who's a fan of the hit show, Lalaloopsy. For more information about Gelarti and all of their different kits, be sure to check them out online. Disclosure: All opinions are my own. I received Gelarti sets at no cost for the purpose of this review. No other compensation was received.